I am a school counselor and have the opportunity to see and measure growth from an outside perspective. Dancing Classrooms is wonderful for our kids and I've seen positive improvement socially and academically. My students and I have LOVED our experience with Dancing Classrooms this year. It has allowed many of them to shine in ways they might not have in the classroom. They have grown and learned so much during their ten weeks of lessons. It is amazing to watch them! Principal Morin of Bay View Elementary in Proctor spoke about the Dancing Classrooms program on an April 5th school visit! Watching the transformation of the sixth graders is what cemented [Harambee Elementary] Principal Griebel’s decision to participate in a second year of Dancing Classrooms. “I want to give that experience to another group of kids,” she says. Lisa Anderson, 5th grade teacher at Pinewood Elementary School, wrote a wonderful letter about her Dancing Classrooms' experience to assist Heart of Dance in applying for a grant from the Rochester Area Foundation to help us expand in the Rochester area. Read her testimonial here. Thank you Lisa for your support! Any school can bring Dancing Classrooms to their students! Each classroom residency costs $4,000, but the school only pays half of that cost, or $2,000 per classroom. Heart of Dance funds the balance. Don’t let cost deter you! We have developed fundraising resource materials for schools and our experienced development staff is happy to support schools with their fundraising efforts if they don’t have funds available in their budget for their portion of the program cost. To date, our Minnesota school partners have had good success in raising their portion of the costs. The residency is offered at no cost to participating students. This unique arts education residency cultivates essential life skills through the practice of social dance while utilizing a highly developed, CASEL (Coalition for Academic, Social and Emotional Learning) recommended social and emotional learning (SEL) curriculum to create an environment in which each child is connected, respected, and allowed to thrive. Research from 2011 has shown that Social Emotional Learning (SEL) instruction increases academic achievement scores by an average of 11 percentile points. Click here to read the complete research article from CASEL. In a 2017 follow-up article, they noted "SEL participants later demonstrated a 6% increase in high school graduation rates, and an 11% increase in college graduation rates." Our integrated curriculum makes it easy for educators to bring new life and add perspective to standard educational subjects including: reading, writing, math, social studies, geography, music, physical education, and visual arts. Administrators and teachers at schools that have adopted Dancing Classrooms report their entire school cultures are positively impacted through the mutual respect, courtesy, and cross-cultural understanding emphasized in the program. Bring Dancing Classrooms to your students next school year! We are now working with schools interested in offering the program to their students for the spring 2019 semester. We are happy to meet with school representatives at their convenience. Please contact us if you would like to bring Dancing Classrooms to your students or if you can connect us with a school that may be interested in bringing this proven and effective program to their fifth or eighth graders! 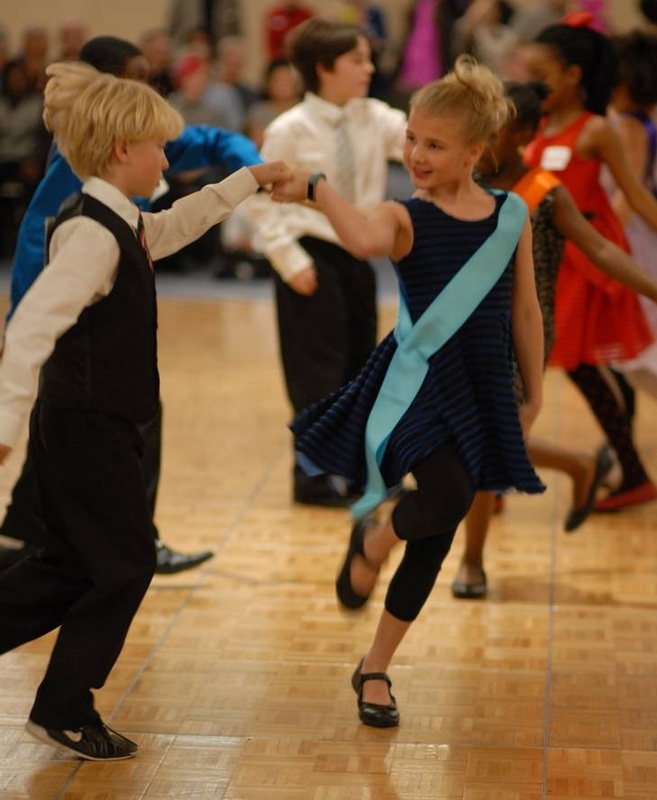 What if someone told you that all it takes to teach kids a whole host of crucial life skills is a little...ballroom dancing? Tatiana Lingos-Webb has spent years getting 10-year-olds to tango with their classmates, and her work reinforces the growing consensus that social and emotional intelligence plays a major role in children's academic outcomes and life success. For the Spring 2019 Semester we have a mix of new and returning schools. Thank you for your confidence in our program! See our Greater Minnesota Page for our participating schools in Duluth and Rochester. Congratulations to our School Partners for successfully completing their residency! We look forward to working with you again. LISTEN TO PRINCIPAL KIRK MORRIS AND STUDENTS FROM BENJAMIN E. MAYS IB WORLD SCHOOL TALK WITH HOST CATHY WURZER ON DECEMBER 11, 2015 ABOUT THEIR DANCING CLASSROOMS EXPERIENCE ON MORNING EDITION ON MINNESOTA PUBLIC RADIO. READ ARTICLE.